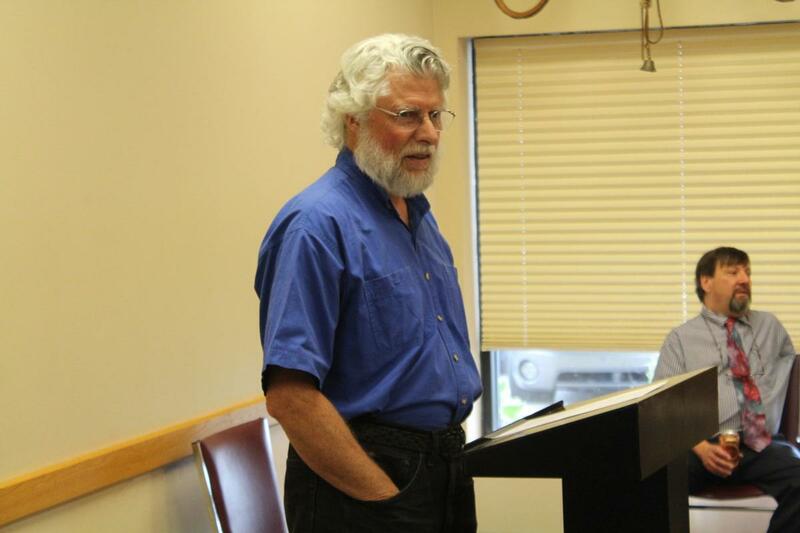 Dozens of people came out to the Bradford County Library last Thursday to listen to a presentation by Ed Nizalowski on the history of the Ku Klux Klan in Tioga County, New York. Photo credit: Nathan Brown, The Daily and Sunday Review. Pictured, Ed Nizalowski speaks last Thursday. Photo credit: Nathan Brown, The Daily and Sunday Review. 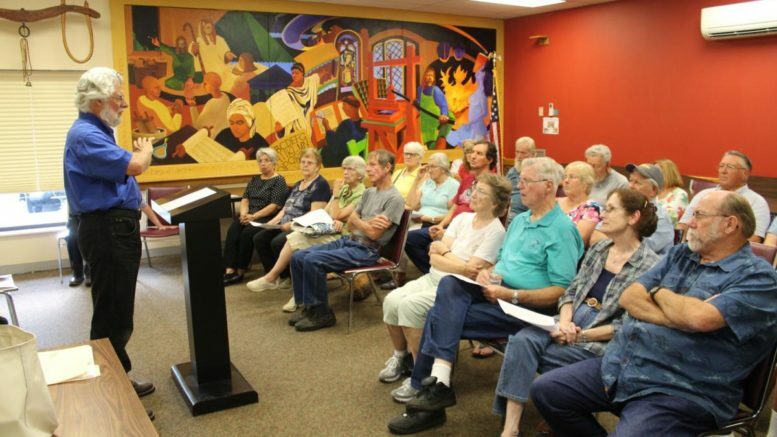 Dozens of people came out last Thursday to a presentation on the history of the Ku Klux Klan in Tioga County, New York, given by Ed Nizalowski at the Bradford County Library. Nizalowski has been researching and studying the rise of the Klan in the 1920s, its impact on the local area and the role it’s played on today’s culture. He went on to state that many people he has talked to do not realize the Ku Klux Klan had a prominent role in the local area. Nizalowski began his research into the topic due to a cross being burnt on the farm of his immigrant grandfather in Tioga County, New York. “He had three strikes against him— immigrant, Polish and Catholic,” he related. Nizalowski touched on four components on the Ku Klux Klan during his presentation, last Thursday. He spoke about its rise during the 1920s, background on the Klan, his personal incidents and oral history and the role it continues to play into modern times of racial discrimination. In referencing the Klan’s enrollment in the local area, Nizalowski focused on Tioga County, but also spoke on Broome County as the New York State headquarters of the Klan located in Binghamton, and also touched on Chemung County, New York. “More people need to accept the fact that this is part of the history and a local phenomenon,” he remarked. Jeffrey Singer, director of the Bradford County Library related that presentations such as that last Thursday are held often at its facility to educate the community. “Education, learning about their neighbors, history of the surrounding area,” Singer elicited as why the library hosts such events. Moving forward, the library will host airings of documentaries, such as ones of the Shanghai Ghetto and Sugihara. The library will also host Dr. Cynthia Huling Hummel, the author of “UnMasking Alzheimer’s: The Memories Behind the Masks,” at 6 p.m. on Sept. 17. Be the first to comment on "The history of the Klan: Bradford County Library hosts KKK presentation"